On the dawn of their grandfather’s 100th birthday the Jones brothers (Henry and Walton Jones) decided they had to honor their grandfather’s legacy in an immense way. After hunting for the perfect spot to launch their new dream, the Jones brothers landed in Tavares, FL which has been also rumored to contain a fountain of youth. Whether an individual travels to the seaplane base for an aerial tour, training or to take a curious sip from the waters, the Jones Brothers & Co is the place to depart for a seaplane adventure! Aviation Insurance Resources (AIR) has had the honor of writing the Jones Brothers insurance policies since 2013. As pilots themselves, AIR insurance agents understand the importance ofproperly insuring a seaplane base while keeping in mind the fun the tour operator brings to tourists and pilots alike. 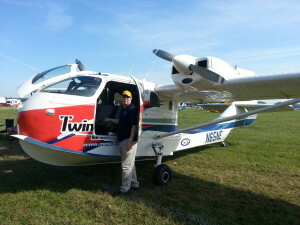 AIR agents were excited to check out the TwinBee the Jones Brothers do multi-engine seaplane training in at the recent SUN n’ FUN Fly–In at the seaplane base at Fantasy of Flight in Polk City, FL. In addition to the TwinBee, the brothers have a Cessna 150, Cessna 180 and Cessna 185 in their fleet. Whether offering romantic getaway packages or tours over central Florida and the Lake of the Ozarks, the crew at Jones Brothers & Co Air & Seaplane adventures can rest assured their insurance is in capable hands-and you can, too! Click Here for a FREE Seaplane Insurance Quote! To find out more about Aircraft Insurance, Seaplane Insurance and Seaplane Base Insurance please contact Aviation Insurance Resources by calling 877-247-7767 or visit AIR-PROS.com today to receive your free Aircraft insurance quote!